As a company with more than 10 years' experiences in marking playing cards and producing infrared contact lenses to see invisible ink marks. We supply series of poker analyzers and poker scanning cameras, marked dominoes and remote control dices and so on. 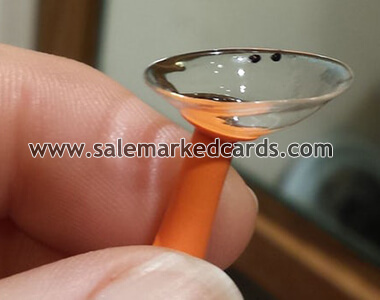 However, in the recent year, quite a lot of customers from different countries, including some of our old friends, ask me about the X-ray contact lenses that can see any playing cards. Our infrared contact lenses to see marked cards has been known well but not people ask about X-ray lenses for clean playing cards without marks! How do you know about the X-ray contact lenses? How do they work to see clean playing cards, any playing cards? There's a poor video on Youtube which is done by others tells this. However, the video is done, not taken. It has a very good idea for future technology that people expect. But it's not practical now and there's no such good technology so far. For the infrared marked cards to see invisible marked cards, some guys say it's not good because it need to buy marked cards from time to time which takes money and also other plays who have the same infrared glasses can read the marks. That's exactly right. The infrared contact lenses works well with marked playing cards while there's also disadvantage. And for the X-ray contact lenses, it seems have no any disadvantage, but it's not real item. It's just perfect in the mind.